Coordinates:81°N 37°WI contacted the Dragon Clan asking if they would like an updated review of their tavern, and received a reply from Skarragon who kindly offered to meet with me. 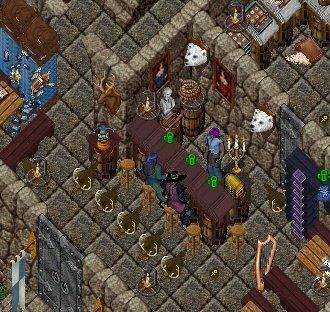 I met him at the tavern, and he gave me a guided tour; the bar area has changed a little since Stingers visit in Mar 2000, with the history of the Dragon Clan written for public viewing (I intend to return and read the english version one day soon). One of the upstairs rooms serves as a chapel, and I was told that a wedding took place there a few weeks ago. The main change of the area is that the Dragon Tavern has become Dragon Town in the past 2 years. 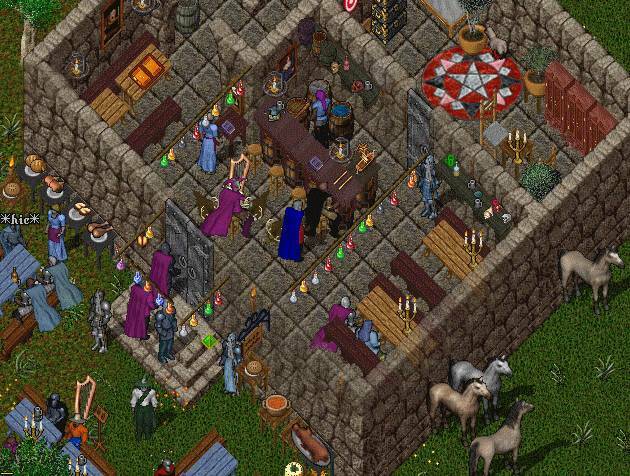 The Dragon Clan has acquired many of the surrounding buildings, and the town includes a Vendor Tower, a Motel, a Butcher, a Baker, an Alchemist and several other buildings. We were joined by several members of the Dragon Clan, returning from a hunt, and I was served a bottle of wine, and had a talk with the clan members including Shivan himself, who told me that he doesn’t tend the bar as he used to, due to the lack of customers, but he hopes that people may return someday. We sat and reminisced about such things as the Trinsic siege, and I was made to feel most welcome.The Dragon Tavern has managed to stand the test of time, and if you’d like to add to the 16900 customers who have visited the tavern, I would recommend a visit. 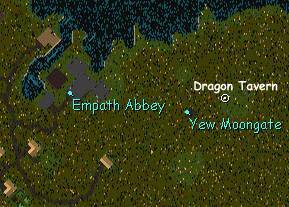 Several days before the announcement of the Grand Opening of the Dragon Tavern in Dragon Town my friend Frarc alerted me to the presence of the town and tavern near Yew Moongate. I made plans to go several times and was detained time and again. Finally, reading of the Grand Opening in the news I determined to go and not be detained for any reason! I so often visit sleepy establishments that I looked forward with pleasure to visit one teeming with patrons and companionship. Impatiently I waited at Moonglow Moongate for it to shift in the direction of Yew, knowing Frarc waited patiently on other side. Finally I saw deep forest wavering through the blue window of the gate and stepped through. On the other side I found not only my friend but a nice fellow of the Dragon Clan to greet me and give me direction to the Tavern, “Just follow the lanterns” he said and indeed there they were to light the path. Only a short distance to the Northeast we came up on the tables and lively guests of the Tavern. Shivan the tavernkeeper can be found daily in the evenings. He is often accompanied by barmaids and can frequently be found at other times of the day as well. Standing on the edge of the murmuring crowd we simply looked on, somewhat taken aback but such a large crowd and the furious pace of activity. The Barmaid Riva approached and spoke in a language Frarc identified as German. I was thankful he’d come along and could translate for me. She invited us to have a seat and handed us menus. After attempting to ask her several questions with Frarc translating she soon disappeared inside the towers depths and returned with Shivan the tavernkeeper who bade us follow him. 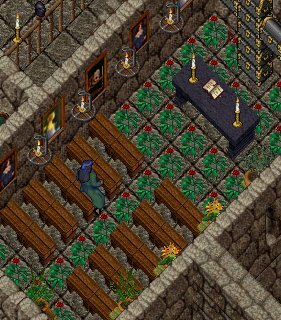 He led us into the tower where the first floor acts as the heart of the tavern with a bar, gaming tables and the tavernkeeper dispenses ale and food to the barmaids. He answered any questions we had and handed me a menu written in English as well. There I found listed such things as are normally found in taverns along with a few unusual selections such as a “Liquor of Magic”. We enjoyed listening to a fine bard play upon the harp and watched stunning fireworks along with the other patrons. We greatly enjoyed our visit and it was with regret that we headed home at the end of the evening.